Labor Day is the official end of summer. The pools close and all the kids are back to school full-time. We celebrate the end of summer by gathering with friends and family and grilling and eating out on our patios to enjoy each others company. 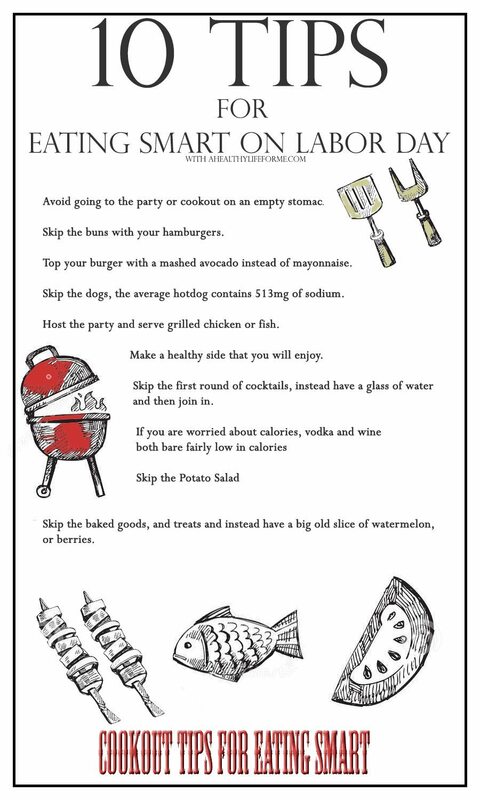 It can be hard to eat healthy with all that food, but I am providing 10 Tips For Eating Smart on Labor Day. #1 .Fill up before you go. Avoid going to the party or cookout on an empty stomach. Eat a healthy snack like a banana, greek yogurt or protein shake before heading to the party. Going with something in your stomach will allow you to taste your favorite barbecue without filling up on it. #2 Skip the buns. Enjoy your burger, but skip the bun, they are usually highly processed sugar laden baked goods that are full of empty calories. #3 Top your burger with a mashed avocado instead of mayonnaise. Avocado is loaded with healthy fats and helps your body with minerals and nutrients. Mayonnaise is an unhealthy fat and is bad for your heart. #4 Skip the Dog. The average hot dog contains 513 mg of sodium which is 20% of your recommended daily allowance. #6 Make a healthy side that you will enjoy. If you are a guest, offer to bring a dish and make something that you will enjoy that is healthy. Check out my Blueberry Corn Salad, the perfect BBQ side dish that is healthy and delicious. #7 Skip the first cocktail, ask for a glass of water instead. This will help you fill up and hydrate. Then enjoy your cocktails, you won’t drink because your thirsty. #8 If you are worried about calories, vodka and wine both bare fairly low in calories. Where mixed drinks may be full of sugar. #9 Skip the Potato Salad. Potato Salad and Macaroni Salad are loaded with tons of calories and unhealthy fats. #10 Skip the baked goods, and treats and instead have a big old slice of watermelon, or berries. If you are worried about your sweet tooth, bring a fruit salad with some coconut whip cream. Don’t miss my other survival tips for eating healthy this BBQ season.